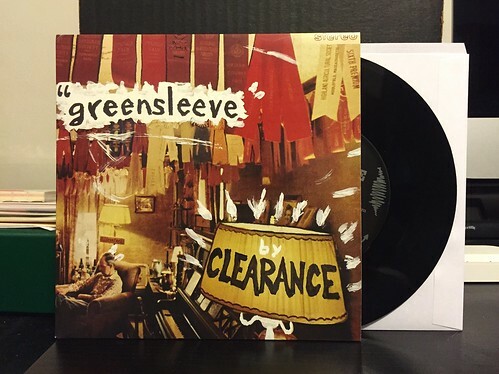 I Buy Way Too Many Records Dot Com: Clearance - Greensleeve 7"
This is the second Clearance 7" I picked up. Honestly, I bought everything they had for sale on their Bandcamp page as soon as I was made aware of how great they were. Greensleeve picks up where their first 7" left off with more phenomenal Pavement inspired indie rock and roll. As I mentioned yesterday, the thing that really makes me love this band is the casual effortlessness they project in their songs. Everything just sound so natural and relaxed. Talk about a band for the summer. All I can picture when I listen to these songs are lush green landscapes and indie rockers having picnics. I know that sounds odd but it's a compliment, trust me. Every song on Greensleeve is as good if not better than anything on Dixie Motel Two-Step. As the bar was set pretty high by their debut, Clearance certainly proved that record was no fluke. My only complaint is I waited too long to find these guys and missed out on the colored vinyl version of this record. If you happen to have one lying around for whatever reason, please get in touch. Again, my highest possible recommendation for both 7"s. I eagerly await their debut full length which is hopefully coming soon..